Thank you for showing interest in your son’s venture into fraternity life! We are happy to say that this will be an extremely fulfilling part of your child’s life. The bonds he will make and the lessons he will learn will stay with him and benefit him for the rest of his life. We know that it is most important for our undergraduate members to have people in their lives that continually remind them of the fraternal values of Phi Kappa Tau and encourage them to make good decisions in college and in life. We hope that you will also talk to your son about his Fraternity experience – the highs, the lows, the things that he wishes he could change, and the things that he values most of all. In the past five years, more than 100 colleges and universities have opened their doors for the first time to fraternities. There are times when a parent is concerned about some aspect of the Fraternity. 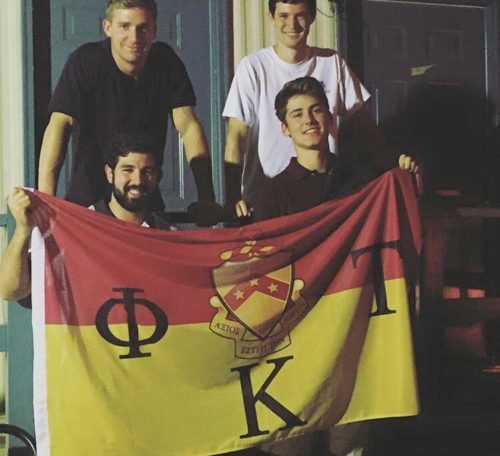 To be sure, Phi Kappa Tau devotes many of its resources to creating awareness about issues that are prevalent on college campuses today – alcohol use, academic achievement, safety, and more. We offer many different programs, both in-person and online, that offer students and volunteers consistent and valuable information. Should you have any questions about Phi Kappa Tau, or fraternity life in general, please also feel free to contact us below.